Review • Burroughs' classic feels modern and old-fashioned. 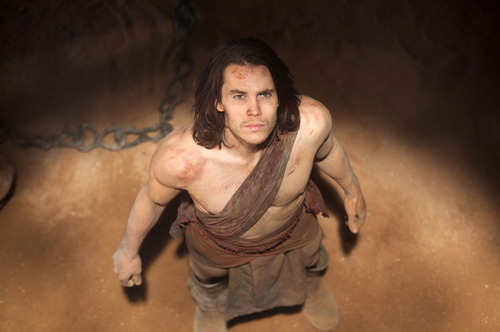 In this film image released by Disney, Taylor Kitsch is shown in a scene from "John Carter." (AP Photo/Disney, Frank Connor) "John Carter" is a sweeping epic based on Edgar Rice Burroughs' pulp novels about a Civil War veteran mysteriously whisked to Mars "No offense to the soundstages, but you get sick of 'em," says Taylor Kitsch, who plays the title character in "John Carter." "Any In this film image released by Disney, Taylor Kitsch is shown in a scene from "John Carter." (AP Photo/Disney) In this film image released by Disney, Lynn Collins portrays Dejah Thoris, left, and Taylor Kitsch portrays John Carter in a scene In this film image released by Disney, a scene is shown from "John Carter." (AP Photo/Disney) Tar Tarkas (Willem Dafoe), left, and John Carter (Taylor Kitsch) film a scene for "John Carter." John Carter (Taylor Kitsch) and Tal Hajus (Thomas Haden Church) on the set of the movie "John Carter." At Big Water, "John Carter" crews built extensive sets to match the naturally otherworldly landscapes. Frank Connor/Disney The "John Carter" crew -- some 275 strong -- turned the slot canyons of Lake Powell into the mystical River Iss. In this film image released by Disney, Taylor Kitsch is shown in a scene from "John Carter." (AP Photo/Disney, Frank Connor) "John Carter" is a sweeping epic based on Edgar Rice Burroughs' pulp novels about a Civil War veteran mysteriously whisked to Mars. "No offense to the soundstages, but you get sick of 'em," says Taylor Kitsch, who plays the title character in "John Carter." "Any time you can work in a live setting, it just brings so much more energy." 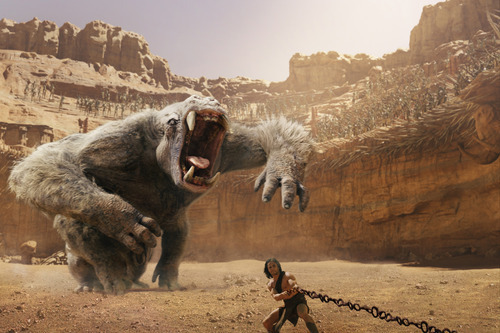 In this film image released by Disney, Taylor Kitsch is shown in a scene from "John Carter." (AP Photo/Disney) In this film image released by Disney, Lynn Collins portrays Dejah Thoris, left, and Taylor Kitsch portrays John Carter in a scene from "John Carter." (AP Photo/Disney, Frank Connor) In this film image released by Disney, a scene is shown from "John Carter." (AP Photo/Disney) Tar Tarkas (Willem Dafoe), left, and John Carter (Taylor Kitsch) film a scene for "John Carter." John Carter (Taylor Kitsch) and Tal Hajus (Thomas Haden Church) on the set of the movie "John Carter." 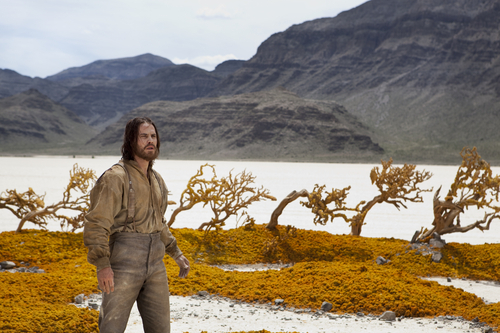 At Big Water, "John Carter" crews built extensive sets to match the naturally otherworldly landscapes. Frank Connor/Disney The "John Carter" crew -- some 275 strong -- turned the slot canyons of Lake Powell into the mystical River Iss. "John Carter," a rousing science-fiction adventure adapted from Edgar Rice Burroughs' early 20th-century pulp novels, is a rare bird that's at the same time strikingly modern and engagingly old-fashioned. Director Andrew Stanton, making his live-action debut after decades as animator and director at Pixar, knows well how to mix old and new. (After all, he had a robot fascinated with "Hello, Dolly" in "Wall-E.") And with "John Carter," he combines epic scale and rugged heroism with the whiz-bang visuals that banks of 21st-century computer graphics can create. The results are eye-popping and exciting, yet oddly familiar. When we meet Carter (played by Taylor Kitsch), he's a tortured ex-Confederate officer hiding out after the Civil War, seeking a cave of gold in the Arizona territory. A U.S. Cavalry commander (Bryan Cranston) aims to enlist him to scout the Apaches, but Carter  nursing the pain of losing his family in the war  has no wish to fight for anyone's cause. Dodging the Cavalry and Apaches, Carter lands in a cave where an otherworldly figure mysteriously transports him somewhere far away. Carter doesn't know where he is, except that he's suddenly able to leap 80 feet in the air. Oh, and the first creatures he meets are 9 feet tall, green, and have four arms each. These are the Tharks, nomadic survivors of a dying land. Their leader, Tars Tarkas (voiced by Willem Dafoe), takes Carter into his tribe, which watches from a neutral position when two groups of "red people"  the peace-loving Heliumites and the warrior Zodangans  battle in solar-powered flying machines above them. Carter, against his better judgment, gets involved in the battle when he rescues one of the Heliumites, the beautiful princess Dejah Thoris (Lynn Collins). It's through Dejah that Carter eventually learns that he's not on Earth anymore, but on Mars  or, as the locals know it, Barsoom. He learns that Dejah is being forced to marry the leader of the Zodangans, the ruthless Sab Than ("The Wire's" Dominic West), or risk the destruction of Barsoom.He also learns there's another player in this drama, the meddlesome Therns, who are pulling Sab Than's strings. Stanton and his co-writers, Pixar colleague Mark Andrews and Wonder Boys novelist Michael Chabon, deftly juggle a complicated story (including a framing device that brings in Burroughs himself, played by "Spy Kids" alumnus Daryl Sabara) that should come with a glossary of Barsoomian lingo. With crisp strokes, the script fills in the details of the long-running dispute between the rapacious Zodangans and the brave Heliumites, as well as the tragically slow demise of the Tharks. And the story neatly traces Carter's arc from battle-scarred veteran to born-again hero. With an army of artists and computer animators, Stanton creates a fully realized world of Martian creatures  including the giant puppylike Woola, who provides some charming comic relief  and an alien landscape from the vistas of southern Utah (which really pops out in 3-D). He also assembles a powerful cast, led by the studly Kitsch and the alluring Collins, backed by character actors such as Ciaran Hinds, James Purefoy and (providing voices and motion performance to the Tharks) Samantha Morton, Thomas Haden Church and Polly Walker. "John Carter" is a gorgeously realized epic that evokes Burroughs' iconic hero (and the movies that were inspired by Burroughs, from "Flash Gordon" to "Avatar") with technical wizardry and a pure sense of storytelling. This is the trip to Barsoom that generations of science-fiction fans have been waiting a century to take. Edgar Rice Burroughs' iconic science-fiction hero gets the rousing action epic he and fans deserve. When • Opens Friday, March 9. Rating • PG-13 for intense sequences of violence and action. Running time • 132 minutes.